The restaurant is setting out snacks for us so there is an $8 entry fee. More details on the Facebook page. If you are hoping to learn a bit more about these things I hope to see you there! 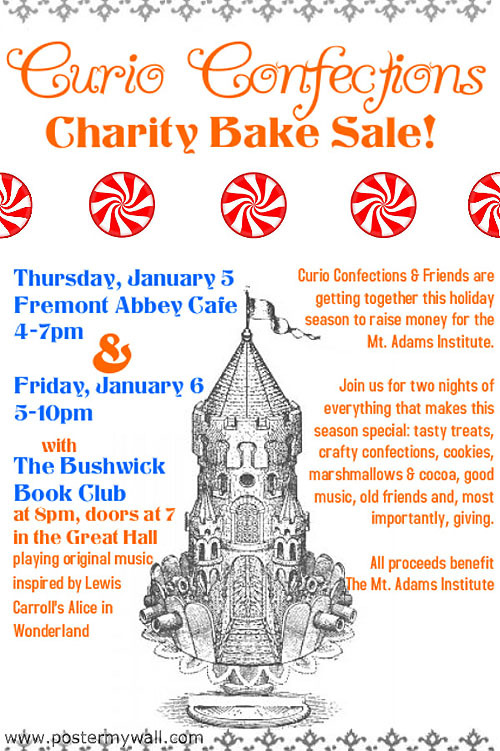 If you live in Seattle I recommend you head out to visit the Curio Confections bake sale this Thursday and Friday evenings. This bake sale is put on by Maria Friedman who previously owned the (very missed) Curio Confections and she is providing a whole lot of goodies from her own kitchen so expect the offerings to be outstanding. If you’d like to contribute something you can get in touch with Maria at curioconfections@gmail.com or 206-979-2442. More info can also be found on Facebook both here and here. See you there? Last weekend we escaped from our poor beaten up house and had a mid afternoon meal at the Skillet Street Food diner. They make bacon jam and started the business in an Airstream. I found a new favorite beer, Port Brewing Wipeout IPA. 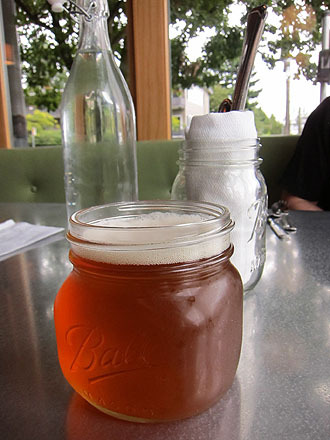 This also marks the first time I had been served beer in a jar. 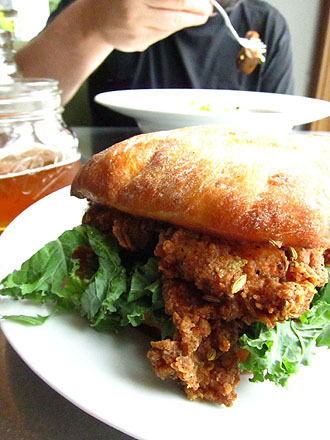 This is a Fried Chicken Sandwich with “fennel seed crust, pickled and charred jalapeño aioli, kale, potato bread”. It’s even better than it sounds. And there is kale so it is good for you. No, it is. Be quiet. 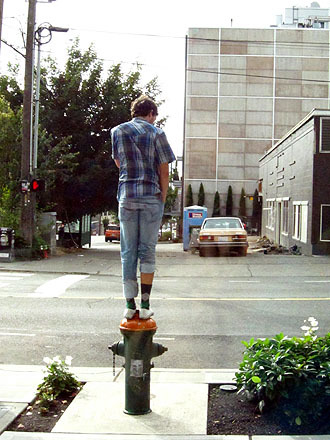 That day we lucked into the booth in the corner and among our views of hipsters walking adorable dogs was this view of a hipster talking on the phone while perched on a fire hydrant. As Scott said, it was like we were in Portland. Pit park! We found an actual pit being turned into a park! It made the whole ride worth it. 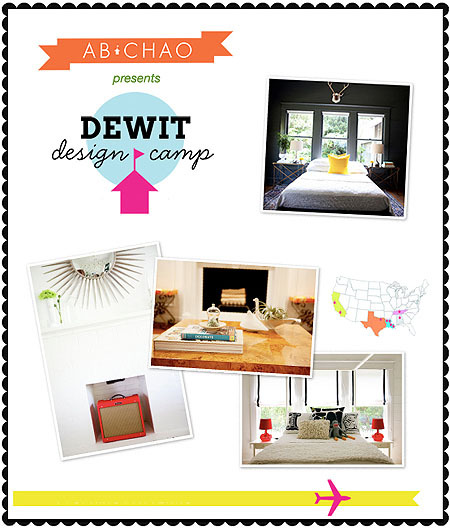 In September I’ll be speaking at School House Craft and I couldn’t be more excited. School House Craft will be three days, September 23rd, 24th and 25th, filled with classes on how to run and grow your creative business. It grew from a conference, CCE, held here in Seattle last year and that conference left me feeling very energized and inspired. If you are thinking of starting a small creative business or hoping to expand your current one I highly recommend this conference. You can find more about it, read about the teachers, classes, and join them on Facebook. Topics will span from marketing, branding, book publishing, photography. You can also have your shop reviewed to get some useful feedback. I’ll be talking about Blogging 101 with Blair Peters, Wisecraft, and Molly Wizenberg, Orangette and I’m so flattered to be in such fantastic company. This is gonna be good. Come join us! The other week I tried Mastica gelato at Fainting Goat here in Seattle. Mastica is, according to the menu, a tree resin from the Greek Aisle Kronos, and according to the Greek friend I happened to be there with it’s a traditional flavor. I expected it to taste like juniper or pine, or maybe to taste the way that pad of resin smells when a violinist resins their bow. But it wasn’t like any of those things. It was delicate and herbal and not too sweet. 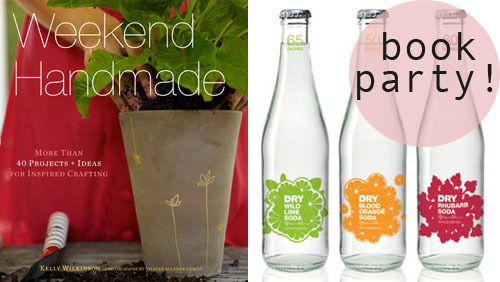 Sort of refreshing, very interesting. I’m so glad I didn’t go with the chocolate I had been thinking about on the way in. Whenever we find an empty circle shaped bit of path or parking lot we ride around and around, sometimes going opposite directions and having conversations in two or three word sections. (“Remember that time” “we were camping” “in Yosemite and” “we heard wolves howling” “and thought they” “might want to” “eat us?”) That’s my favorite part. If you live in Seattle and are curious about the rides: This weekend we took the Sammamish River Trail from Marymoor Park in Redmond to Red Hook Brewery in Woodinville, where we had lunch and beer, and back. This is a highly recommended trip and wasn’t too long. If you time it right you can take one of their beer tours and have lunch, and possibly more beer. The next day we took the Cedar River Trail, where we recommend parking in the lot just east of and sort of beneath 405. The trail northward through Renton and to the water at the bottom of Lake Washington is walk-only most of the way (a lovely walk though!) and if you bike the streets you’ll need to cross some busy intersections and it’s not fun at all. 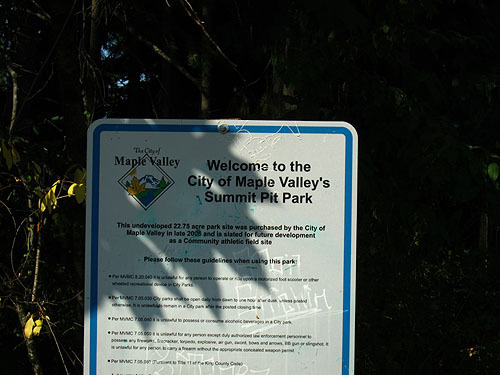 So park in that lot and head south-ish and there is a really lovely bit through a wooded section and then the trail is sandwiched between the river and Maple Valley Highway. It wasn’t the most interesting out there but it wasn’t crowded, had plenty of places to stop, and had straight enough sections that you could build up some speed and let your mind wander. 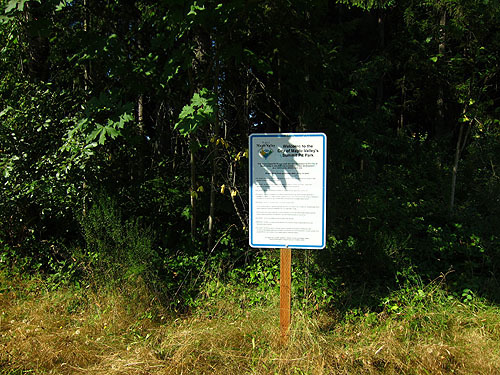 The King County Bicycling Guidemap has been really useful, but do look for warnings on trail pages, the Green River Trail is currently closed to bicycle traffic which happily we noticed before we went all the way out there. Last month I took a picture of the Space Needle from the Columbia Tower Observation Deck (also shown below). Last night I happened to find myself on top of the Space Needle, so I took a picture of the Columbia Tower to compare. They both seem tiny from these vantage points. Hello tiny self way over there! Posters by Row Boat Press, this Night Flight diptych is also glow in the dark. Simple jewelry by Foamy Wader. I bought myself these in silver, they are delightfully light weight. Really fun bias tape from Polly Danger. Gorgeous enameled jewelry by Alisha Louise, you get to chose your color for each piece. I have my eye on this pull-though necklace. These chiffon earrings from Muchodesign, she had a whole tree of them and they were delightfully flitty. Is that a word? An LED Sewing Kit from Sternlab which was sold by the lovely Moxie, who offers this Needle Felted Coin Cell Battery Pack tutorial so you can create your own glowy pendant. Jewelry by Dottyspeck. I have some earrings similar to this design that I picked up from the CakeSpy Shop and adore them. See also: I listed businesses I went to see there in a previous post. Love them all. There are so many vendors this time around that I have not heard of, and lots of them are foods (ice cream! cake pops! preserves! gluten-free treats!). update: See which businesses I found and loved at the show. It’s not well known but one of the best views in Seattle is from the Observation Deck of the Columbia Tower (one of our skyscrapers). To get there you take a bank of elevators up to one floor and transfer over to another bank of elevators and, hold on, what do you find as you’re walking past? A Starbucks! A Starbucks with a pretty great view. Above is one of the first views that greets you from the Observation Deck. I’ve circled the Space Needle in orange to show you how tiny it seems from the Columbia Tower. See? Cute. Here is the proof of the Starbucks. It’s free to get up to it, by the way. To get to the observation deck you take the bank of elevators in the North Lobby to the 40th floor, pass by that Starbucks, then take those elevators to the 73rd floor. Follow the signs to the left. It’s about $5 per person to get in and then you find yourself looking down at the Space Needle, which is pretty cool. The views are nearly 360 degrees and on a clear day you can see all the surroundings mountains. It’s far cheaper than the Space Needle, involves a whole lot less waiting and zero souvenir photographs. (The Space Needle, though, does have glass elevators and a rotating restaurant.) It’s one of my favorite places to bring visitors. And not just to show off that yes we really do have Starbucks everywhere. update: Not too long after this I found myself taking a picture of the Columbia Tower from the top of the Space Needle for comparison.